A new exciting fundraising event for us! To start the weekend with an amazing exclusive opening Friday night party,commencing 6.00pm, tickets available for $45 each, for drinks,canapes,live music, opportunity to preview and purchase the artwork, via our unique silent auction, and a sneak preview of some of the best short films on show for the rest of the weekend. 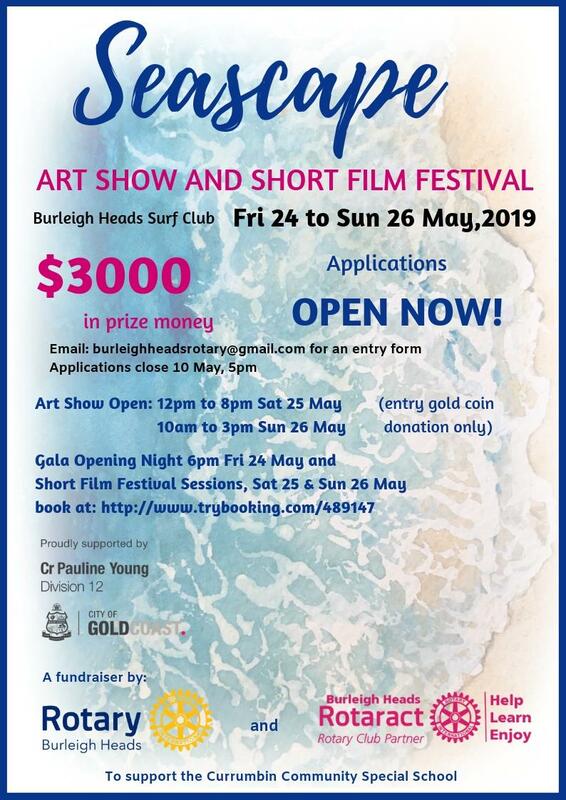 If you miss out on that then you can attend on Saturday and Sunday for only a gold coin donation to the Art Show, $7.50 for adults for the Short Film Festival.Then at the last short film session on Sunday, we will be awarding the prizes for the art show and short films. Entry Forms now available via download from this website,under the centre Seascape poster image. 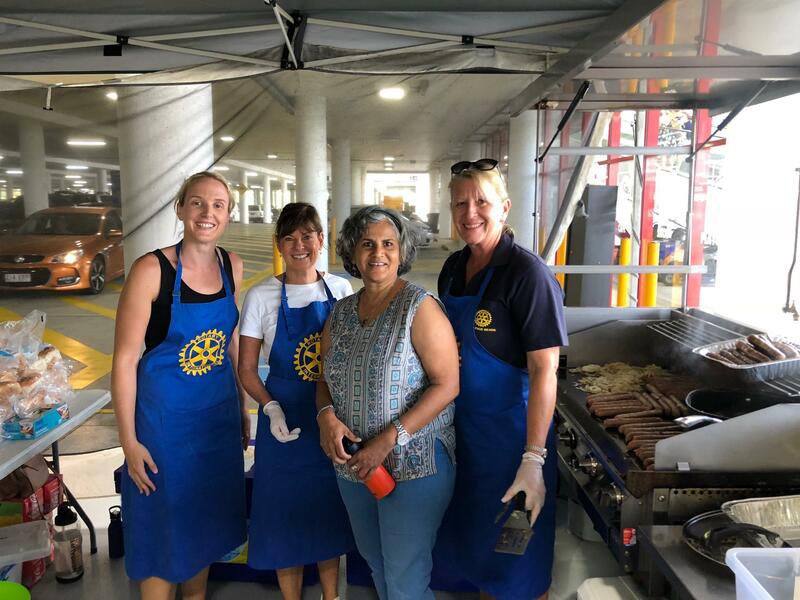 Have you thought about joining a Rotary Club? What could be better than doing good in your local community and worldwide, yet having fun and making lifelong friends at the same time? WHY NOT join us any Thursday morning and see what our Club is about. Check out our latest video. 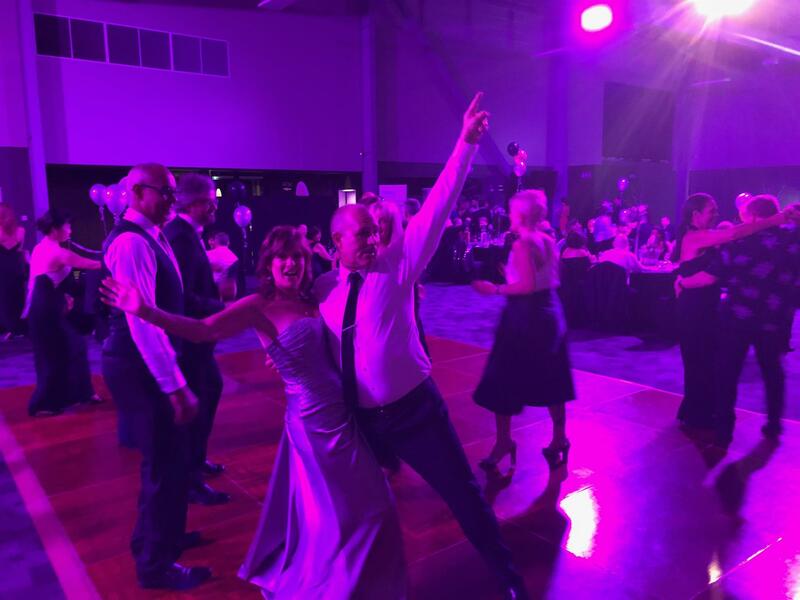 Rotary Gala Ball a huge success! In partnership with the Gold Coast Rotary Club,we held the Rotary Gala Ball-Diamonds are Forever and what a success it was.Everyone having a fantastic time, great DJ,music, food and drinks all night,the $7500 diamond ring raffle went off, the donated items in the silent auction went for a total of nearly $19,000, magic balloons were sold and a live auction raised another couple of thousand dollars. Figures will be in soon on how much we made but it looks good! 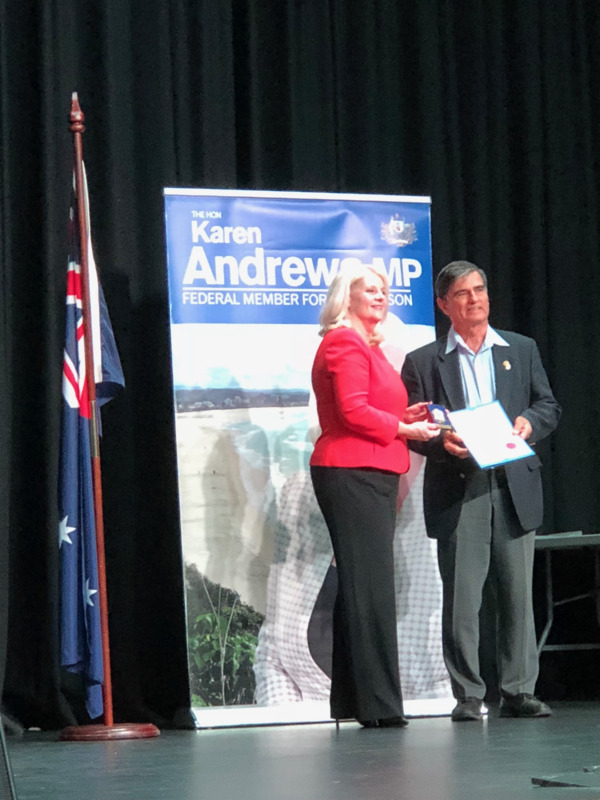 One of our hardest working members,Brenley Milsom was awarded with a McPherson Community Achievers award today by the Hon Karen Andrews,Federal Member for McPherson and Minister for Science,Innovation and Technology in recognition for not only all the time and effort that he puts into our Club with Donations In Kind, and regular container packing to Timor Leste, BBQ's and other fundraising events we hold, but Bren is also an active member of the local Catholic Parish and other community organisations.He never stops. 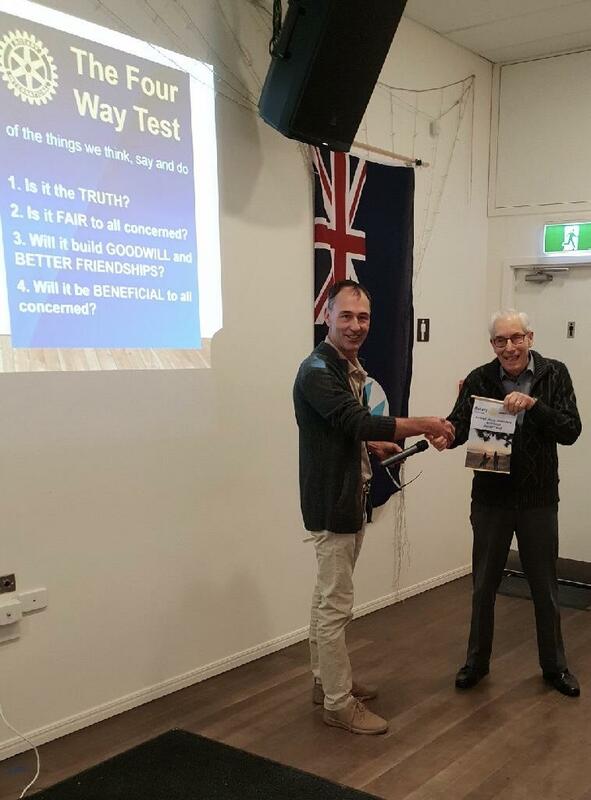 Last year another very active member,David Ungar was given the same award. 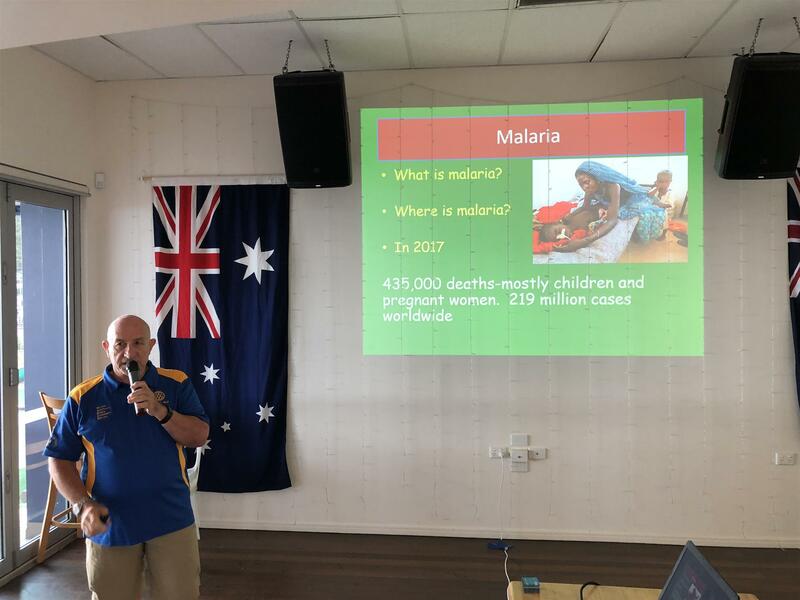 A real feel good story from two inspired Rotarians,Sharon and Peter Crean who have set up Beyond Water, to assist the very poor in East Africa. 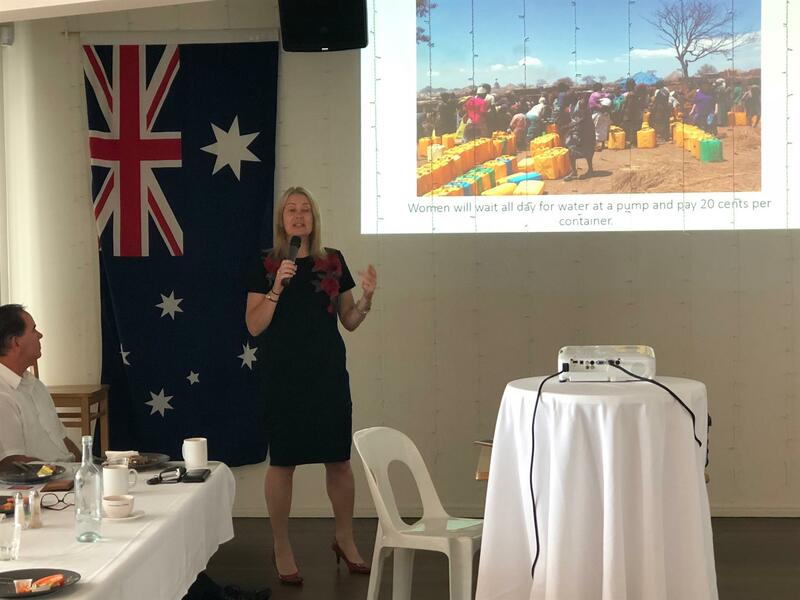 we heard of the wonderful work they do providing water and sanitation facilities to extremely remote communities;water tanks and guttering,hygiene clinics,new toilet blocks,water solutions. We also had our very own African trinkets market stall,they set up at our meeting to buy things to support their project! At today's meeting we heard from Ross Smith,our Rotary International Director, of his numerous experiences on overseas trips to provide aid projects to third world countries in the Pacific and Africa, in particular ,Fiji where Ross has been involved in many projects.So he was resplendant in a sulu and flowery fiji shirt with coconut shell buttons!In addtion we had a guest,Geoff Lloyd from Oshawa Rotary Club in Canada, and other's spoke of seeing Rotary around the world involved in many aid projects. 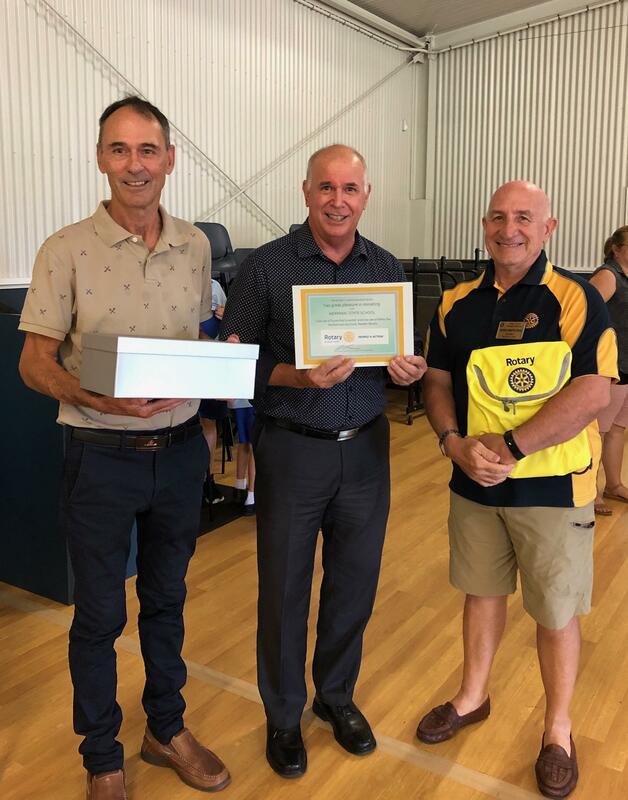 President Allan Barnett and our Rotary International Director, and former High School Principal Ross Smith attended the Merrimac State School Junior Parade this week to present to the school a set of 24, Suzie the Scientist and a set of 24, Millie the Mathematician Early Reader books for the school library.These books,developed by Professor Richard John of the Griffith Unversity are designed to no only teach the chldren to read, but also develop their skills in Science and Mathematics, very important for their future! Donation Point Facebook post goes viral! To help with our fundraising causes, we have a "Donation Point"- this enables anyone to donate $5 in five seconds by Tap and Go technology! 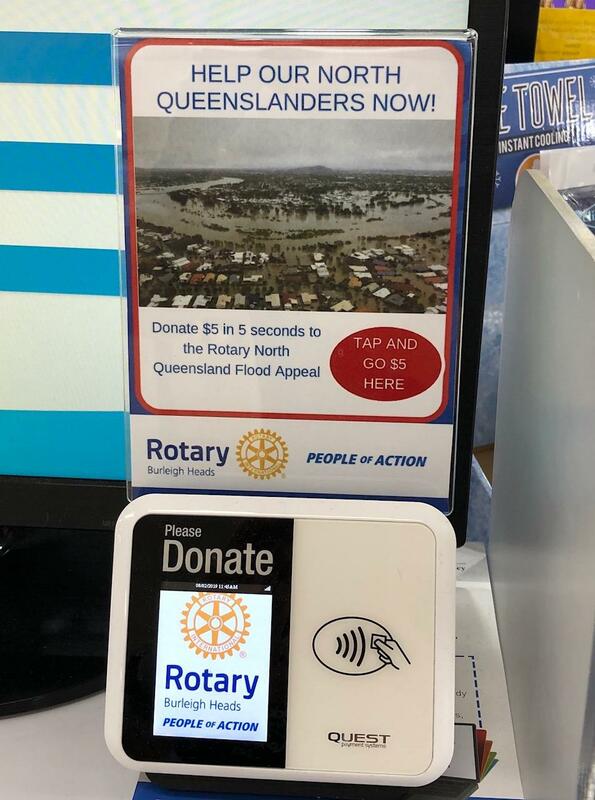 It is currently at Chempro Pharmacy at Stockland, Burleigh Waters, the one outside facing the carpark and all donations from it will now be sent to the Rotary North Queensland Flood Appeal. We posted this on Facebook last week and it went viral- reaching 3200 people in 4 days and 530 engagements, a great result to get the word out there about helping North Queenslanders. if you wish to donate right now there is a Link on this page. 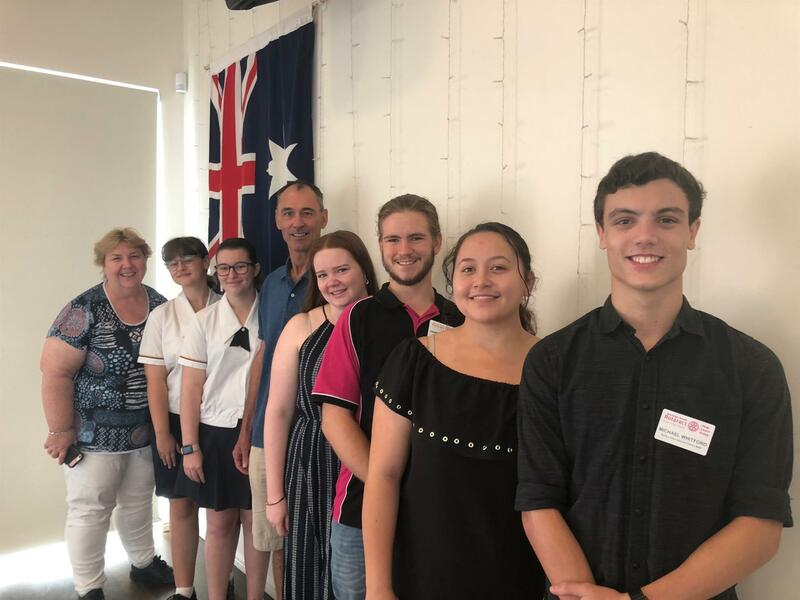 It is fantastic to see the Youth project commitment from our Club with seven of our members travelling down to Tyalgum,NSW for the RYLA dinner to support Blake Foster from our Rotaract club, who we sponsored,as well as all the other RYLA participants. What is RYLA- Rotary Youth Leadership Awards, a premier youth leadership development program for 19-28 year olds, involving a week long camp designed to promote proactivity and personal and professional development through a range of inspirational speakers, teambuilding exercises and leadership training. 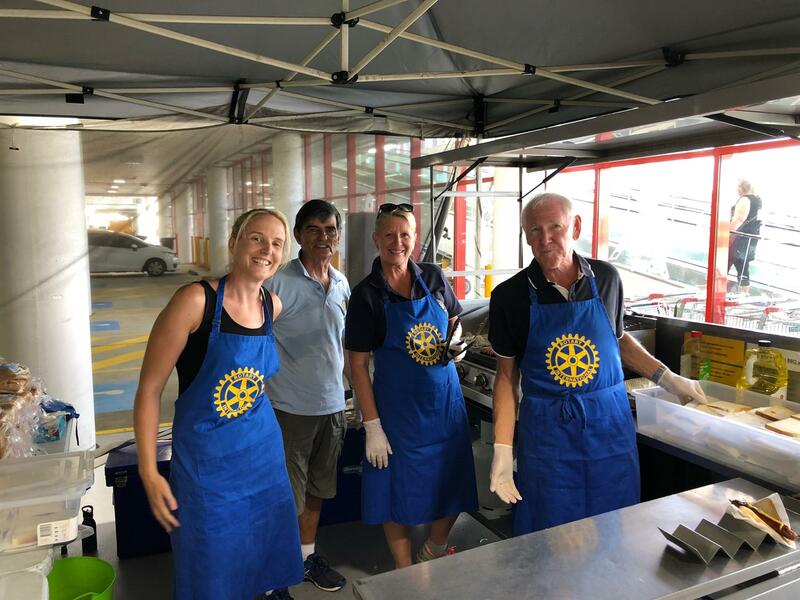 What an amazing effort - on a Saturday morning we had seven of our members and also seven from our Rotaract Club at the new Donations In Kind (DIK) depot at Brisbane, a Rotary Australia World Community Service (RAWCS) activity. 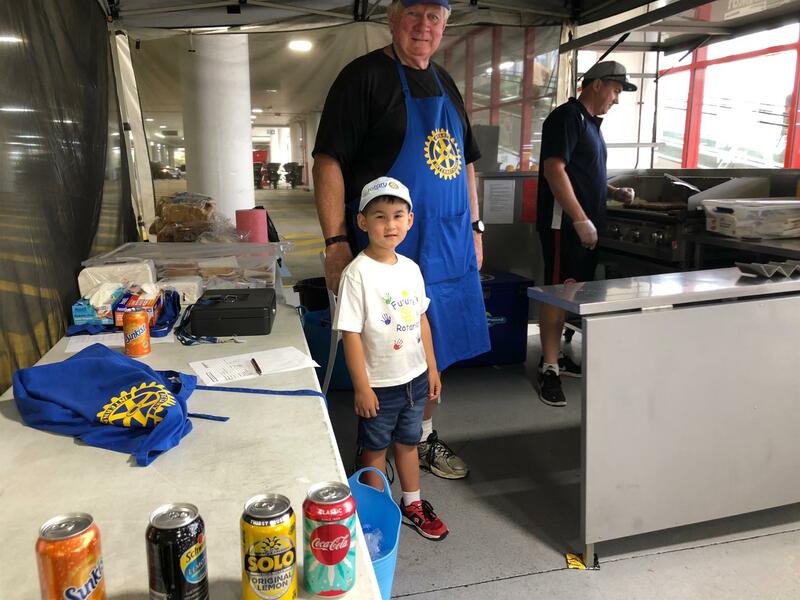 Rotary Youth Exchange Program- a family affair. 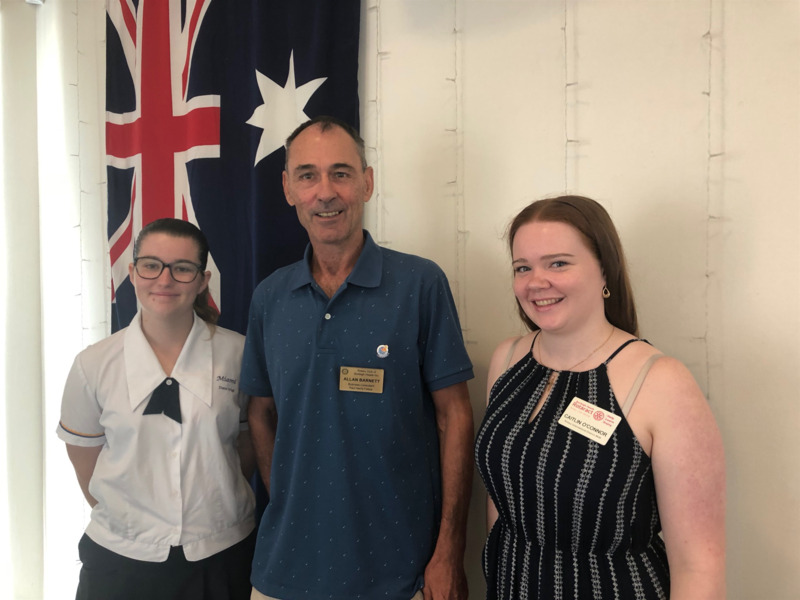 Our Guest Speaker today was relatively new member John Campbell, and what a great presentation he gave about his very long term connection with the Rotary Youth Exchange Program, being invited to be a Youth Exchange student in 1992 by Mermaid Beach Rotary Club, going to Denmark for a year of excitement and amazing adventures, not just in Denmark but all of Europe. 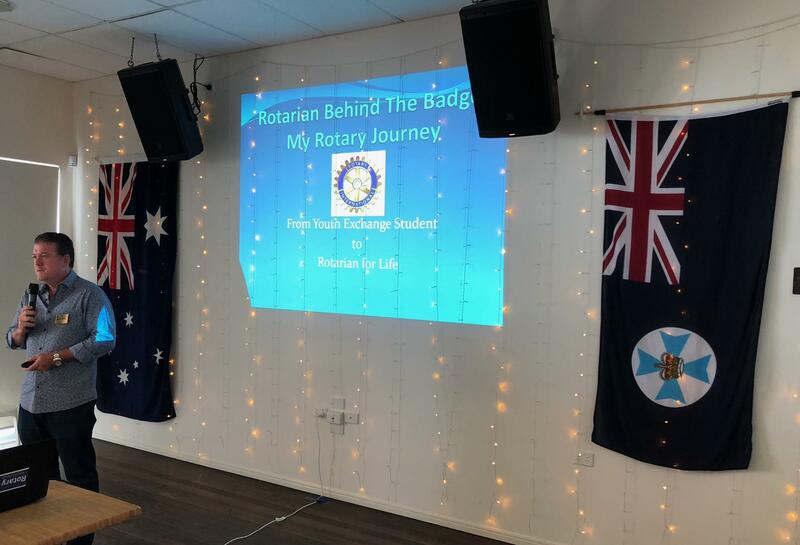 When he returned home he then gave back to Rotary by first joining Surfers Paradise West Rotary Club, then eventually being involved in running the Youth Exchange Program for the District and also RYPEN, RYTS and RYLA, other very worthwhile youth programs of Rotary. 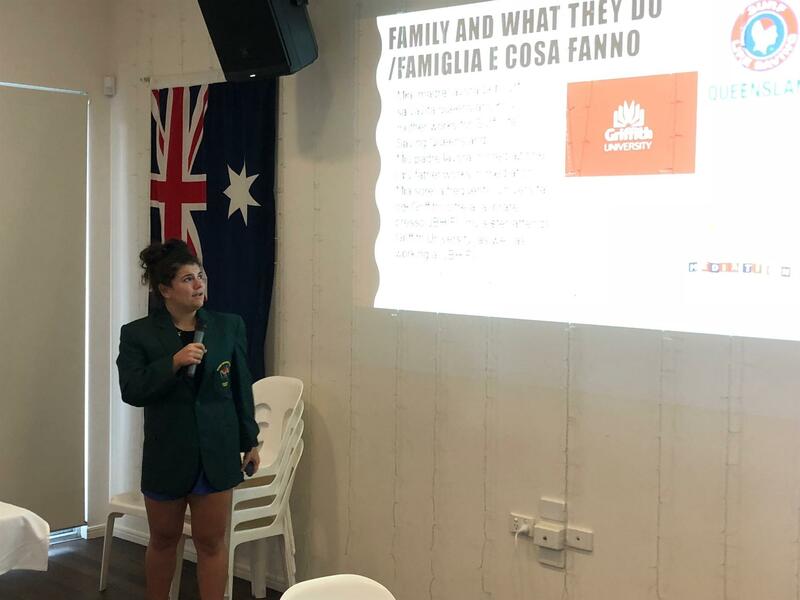 He has now joined our Club last year and amazingly his daughter Emily is now a Youth Exchange Student, and sponsored by our Club, she left last week fo a year long adventure in Italy! BBQ No 2 for 2019 already! Yes another on call, Bunnings BBQ at Burleigh Waters store, on the same day as our breakfast meeting. We just managed to get enough members to volunteer along with friends and relatives considerate enought to help out for a worthy cause, raising around $700 this time. 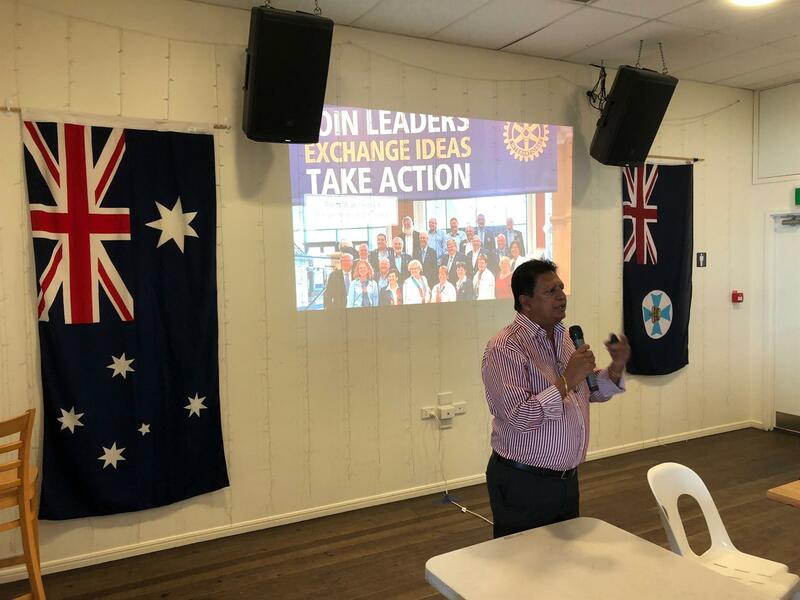 Club member Andy Rajapakse, who is District Governor Nominee, gave a very interesting presentation on what will happen when our District 9640 merges with our other two closest Districts to form a new District 9620 on the 1st July 2021. 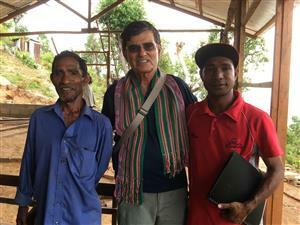 This new District will have 170 Clubs and 3500 Rotarians! But we will still be People of Action! Afer a welcome Christmas break we had our first breakfast meeting today and it was another busy, interesting one , with the induction of another NEW member, Greg Evans, friend of Secretary Charles Kilby, a great presentation by Emily Campbell, our sponsored Youth Exchange Student, who is going to Italy for 12 months, and daughter of Club member, John Campbell, and also a presentation of a PHF to Madison Birtchnell, sister of member Taylor Birtchnell. Another Bunnings Barby while we are on holidays! Even though we were on our Christmas break, we were given a Bunnings BBQ to do on Sunday 6th January! Unfortunately we did not raise as much as we normally do, as many others were on holidays too! But still managed to make $1400 for our effort! 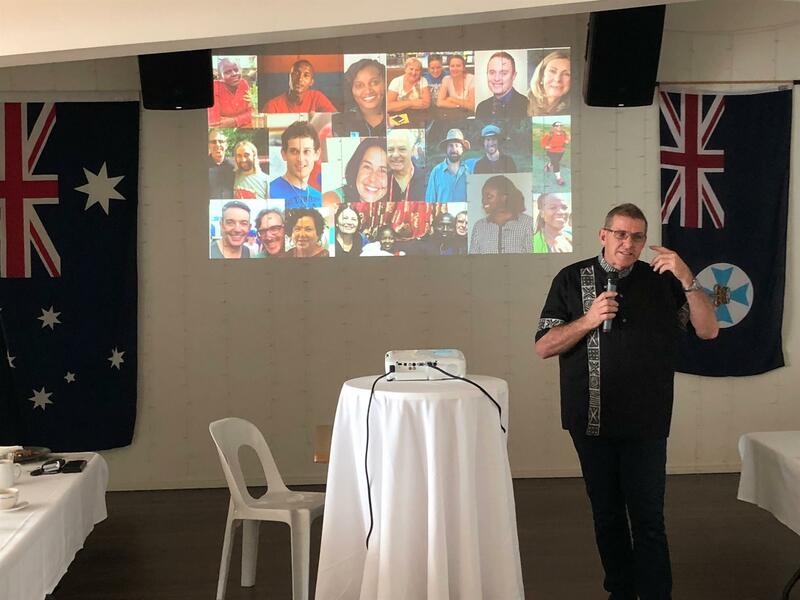 President Allan Barnett, decided to conduct a survey of members at our Open Forum meeting last week and this resulted in some very positive suggestions for new fundraising ideas and new Community Service projects, which we intend to impliment in 2019. Another great year for our Club and everyone is looking forward to 2019. We are on standby at Bunnings Burleigh Waters, which means we can get only a few days notice to do a Barby! Thanks to Past President, Richard Spencer and Project Service Director, Shamus Davies, they have it all in hand and ready to go. Another $1000 raised to our funds. 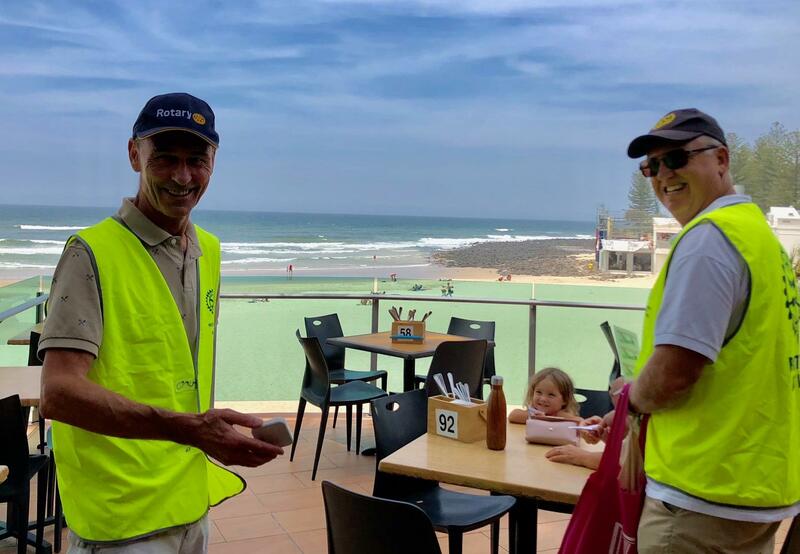 All our Club members take tickets to sell in this competition, but having some leftover, President Allan Barnett, and Secretary Charles Kilby, took time out to sell the remaining tickets on Melbourne Cup Day, many thanks to the Burleigh Heads Surf Club. This made it a great success and we managed to raise $2340! which will go towards local community projects that we undertake. Many of our Club members attended the Charter Dinner of a new Club for our District, Varsity Lakes Club on 26th October. 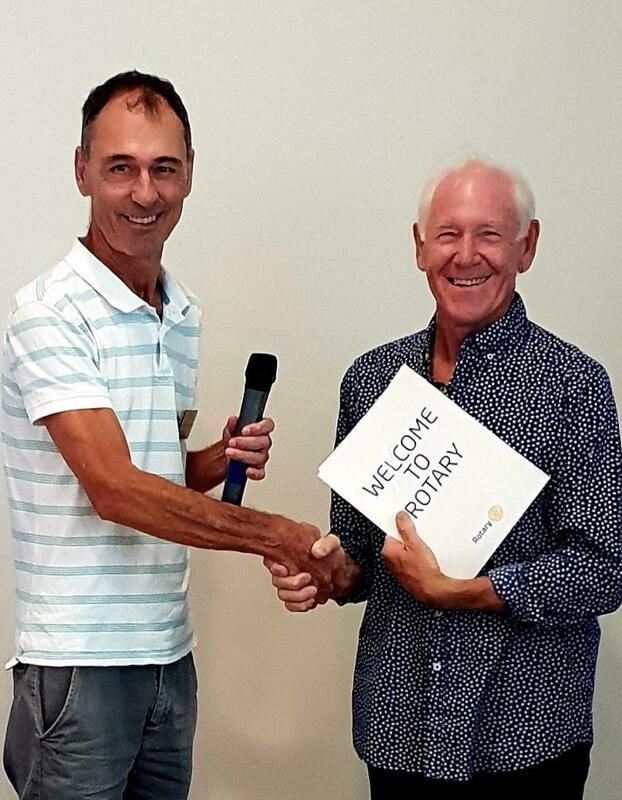 They had 20 new member inducted as Rotarians on the night and our member, Andy Rajapakse was a special guest, being a driving force to create this new Club. 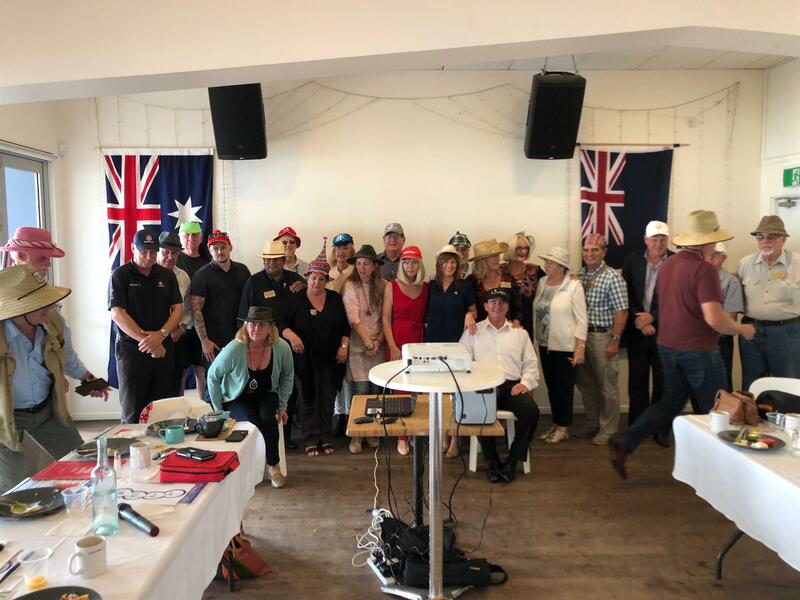 We have our hat day breakfast meeting each year in October to align with Mental Health Week and rasie funds to donate to Australian Rotary Health who use it for Mental health Research, a very worth while cause. 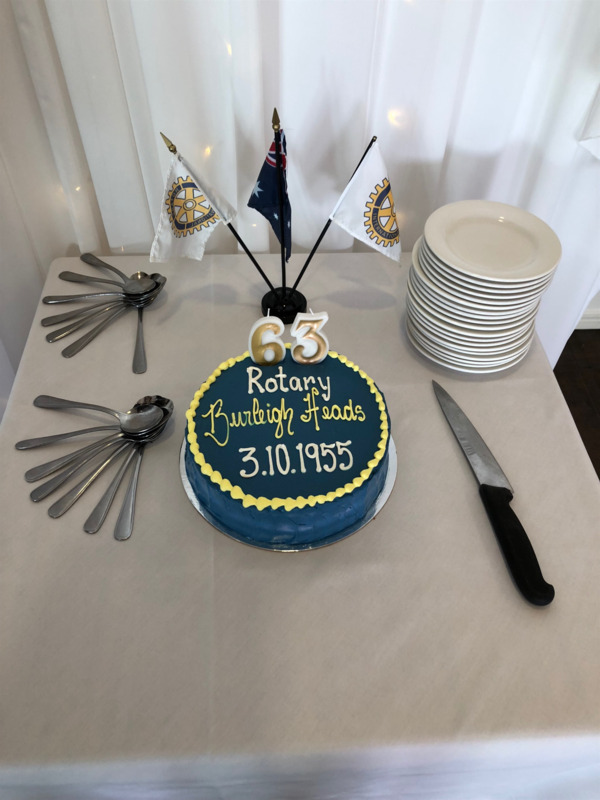 This week we celebrated our 63rd Birthday since being Chartered by Southport Club on the 3rd October, 1955.So we have been around a while now doing good things in our community for a very long time. Our weekly breakfast meeting with it all! How do we fit it all in an hour? Sometimes it's difficult but always very entertaining, so why not come a long to see for yourself?This week we had a visit from GCCC Division 12 Councillor Pauline Young, giving us the latest on the light rail expansion to Burleigh Heads, President of the Rotary Club of Villa Real, Buenos Aires, Argentina, looking for our assistance as a Global Grant partner Club for a project they are doing and also another visit by Jack Porter, Rotarian from New Zealand.These two Rotarians were both presented with the first of our new Club banners! 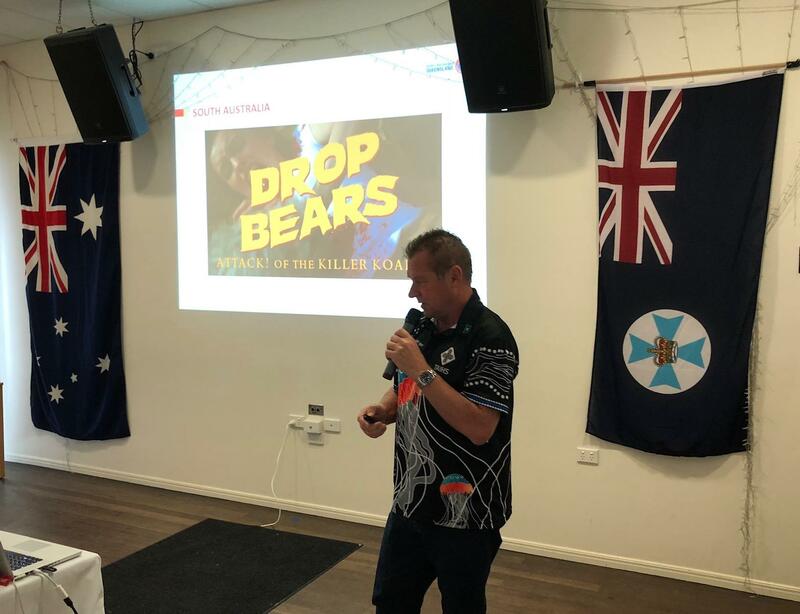 last but not least, far from it, we had our very own Ken Clark who always puts on a good show as Guest Speaker, this time on " the dangerous creaures of Australia" and we have got plenty! Our Changeover Dinner 23rd June 2018, A fantastic end to our year. A great night was had by all with current President Richard Spencer, handing over the chains to incoming President Allan Barnett. 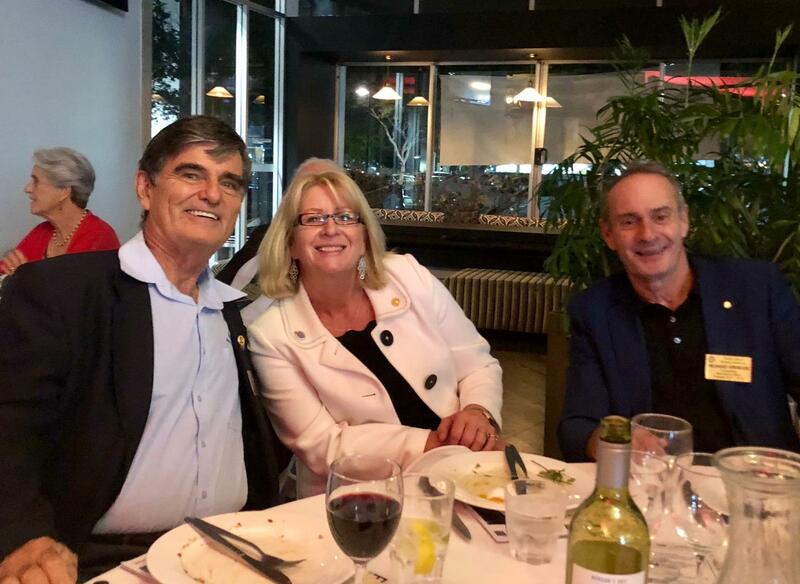 Good food, wine and company with Chief Guest Past District Governor Michael Irving, and Guest of Honour Hon Karen Andrews MP, Federal Member for McPherson. 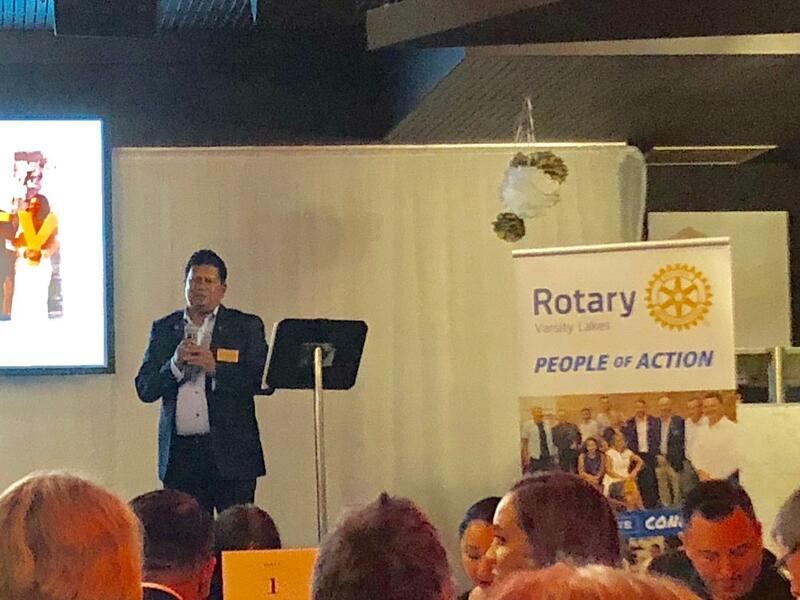 A highlight of the night is the announcement of our Club awards: Spirit of Rotary Award: Andy Rajapakse, 4 Way Test: Allan Barnett, Community Service: David Ungar, Rotarian of the Year: Bren Milson, Doug Mendoza Shield: John Clark. In addition, Years of Service Recognitions: Catherine Pevy Trewartha: 10 years, Ken Clark: 25 years, Andy Rajapakse: 30 years, Bren Milsom: 35 years, Russell Thomson: 45 years. Oher trophies handed out were to Luca Mueller, our Youth Exchange Student, and Steven Coffey, Rotaract Award. and finally a framed letter from Rotary International President Ian Riseley to Russell Thomson for 47 years of service to Rotary! 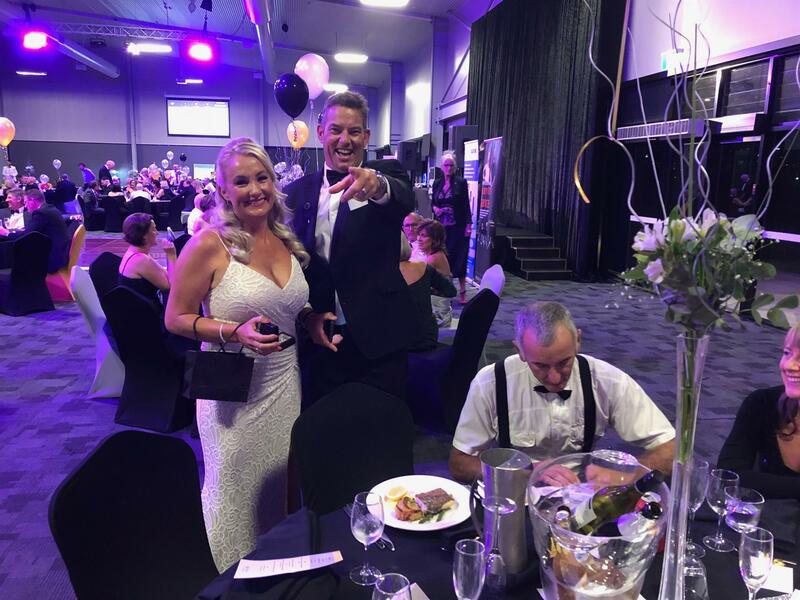 Many of our members had a memorable night at our Gala event last weekend, raising money for our special project for the new Rotary year- Currumbin Community Special School. Lots of fun on the night with great food, music and silent auction at the Convention Centre. 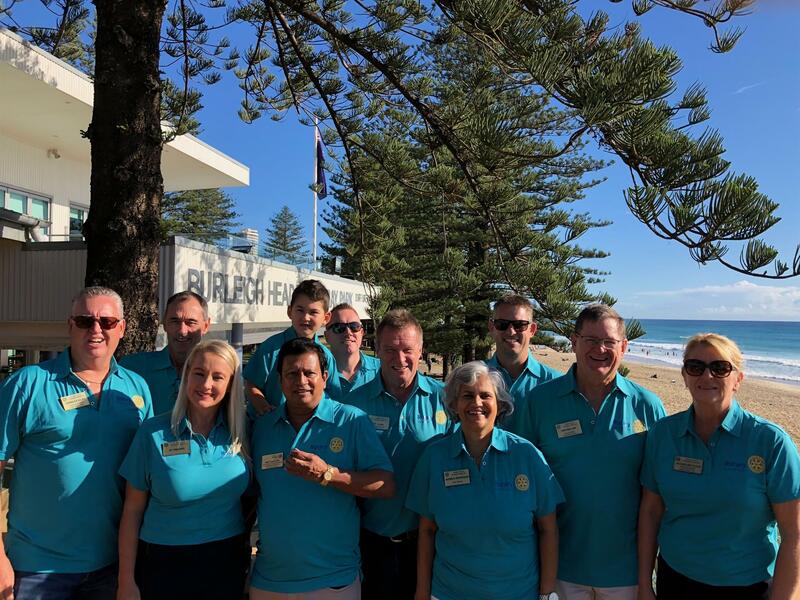 The Rotary Scooters Project on the Gold Coast provides mobility scooters to those in our local community suffering restriction in their movements as a result of illness, advancing age or disability. Without the financial means to hire or purchase a scooter, the only alternative is a wheelchair. This results in many becoming unnecessarily housebound, as wheelchairs typically lack outdoor versatility and cannot be powered for long by the physically weak. 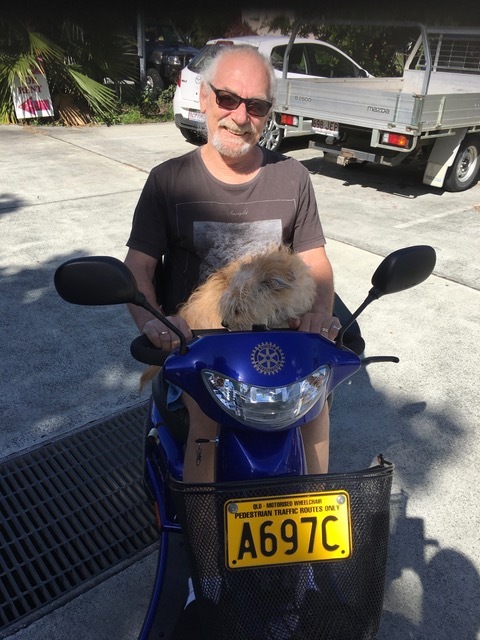 Through the Rotary Scooters Project, many have found new freedom, confidence and independence by being able to get out and about under their own steam, running errands and taking part in normal social activities. Each mobility scooter costs the club up to $5000, but are provided to users for a minimum of $1 per annum. 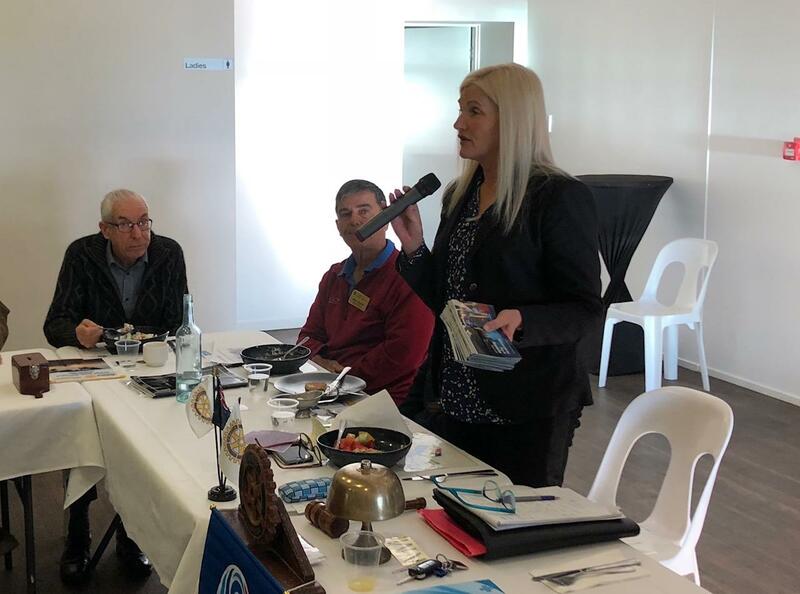 We have raised a total of $118,000 in grants from Queensland Government Gambling Community Benefit Funds and other sources, plus our regular Club fundraising provides the funds for the ongoing costs of annual Insurance and servicing the fleet . Hence Project Officer, David Ungar is kept very busy looking after all the participants scooters with maintenance requirements nad delivering and collecting scooters! The latest grant of $32,000 we received in October 2018,has enabled us to purchase 5 new scooters plus an additional 5 are on order for delivery in February 2019, all to replace our older fleet. International Service: RAWCS and DIK Volunteering at Brisbane Depot to load containers. 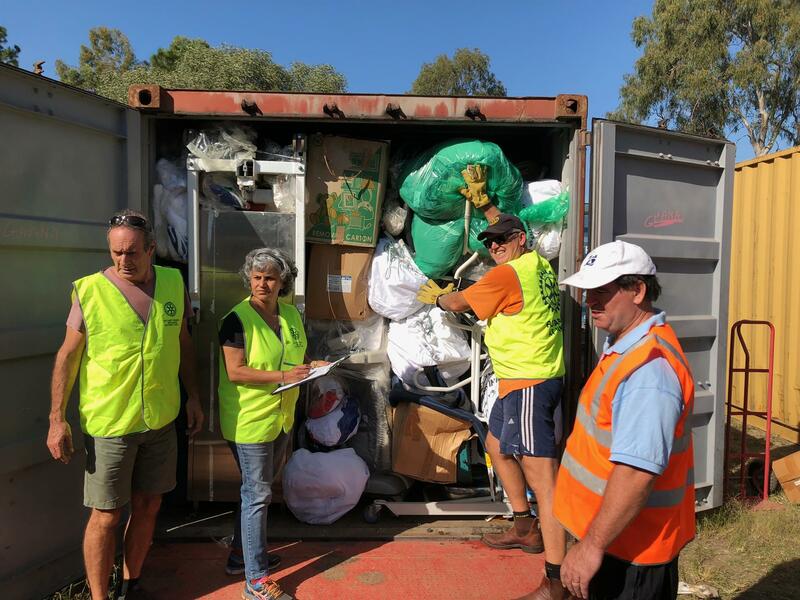 Our Club regularly volunteers to load shipping containers with used educational and hospital equipment and general goods that are desperately needed in the Pacific countries, PNG and Timor-Leste. Our Project Officer, Bren Milsom works tirelessly, constantly sourcing these goods on the Gold Coast from schools, aged care homes etc and regularly goes up to the Brisbane depot to store the goods before packing in the shipping containers. Following an initiative by our District in collaboration with Griffith University, our Club is very proud to donate one set each of Suzie the Scientist and Millie the Mathematician books to three local primary schools, Burleigh Heads, Caningeraba and Merrimac. These amazing books were developed by Professor Richard John to fill a need for quality books to teach young children very important subjects for their future- Science and Mathematics! 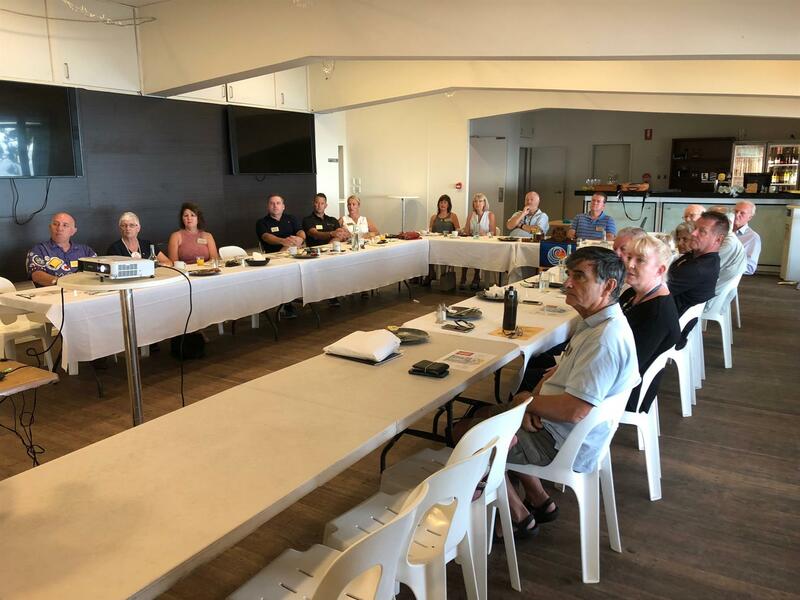 We are proud to say that former District Governor Michael Irving, who attends many of our meetings as a Burleigh local, lead the committee and our very own PDG Ross Smith, was on the committee that instigated this project for our District. 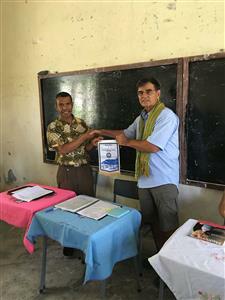 This project, lead by Bren Milsom, was to fund and send volunteers to assist in the improvement of drainage,water supply & electrical systems in a renovation and refurbishment of the roof,classrooms,toilets and other facilities of this school, a major project with a total cost of $USD177,700 of which Rotary contributed $57,500 worth of roofing elements,tanks etc. In addition two shipping containers have been sent with equipment and supplies for the school and others from the RAWC's depot in Brisbane and our Club participated in loading these containers.